Can you imagine! = Said when something is done wrong, or if someone does something not normal. Food = Starchy or main food. How is there = How are things at home? I kissed your car = I just smashed in your fender! It's there = Somewhere in a specific direction. It’s not there = I'm sorry the item you have ordered (at a restaurant) 10 minutes ago appears to be out of stock. I'm so sorry to have wasted your time. Not so? = Am I right? The Baganda call ‘arms’ hands. So when you are talking about sleeves they say, your hands are big! What baby? = Is your baby a boy or a girl? When someone asks you if you want something and you say, "It's okay" in America that would mean no, but in Uganda it means yes. Where do you pray from? = What church do you go to? So, Do You Speak African? We've heard that question or comment often while in the states. Africa is the least known continent in the world, or so it seems. Everywhere else people know you from the country you live in or are from, except for countries in Africa. We thought we'd take a few minutes to 'update' you on Africa. 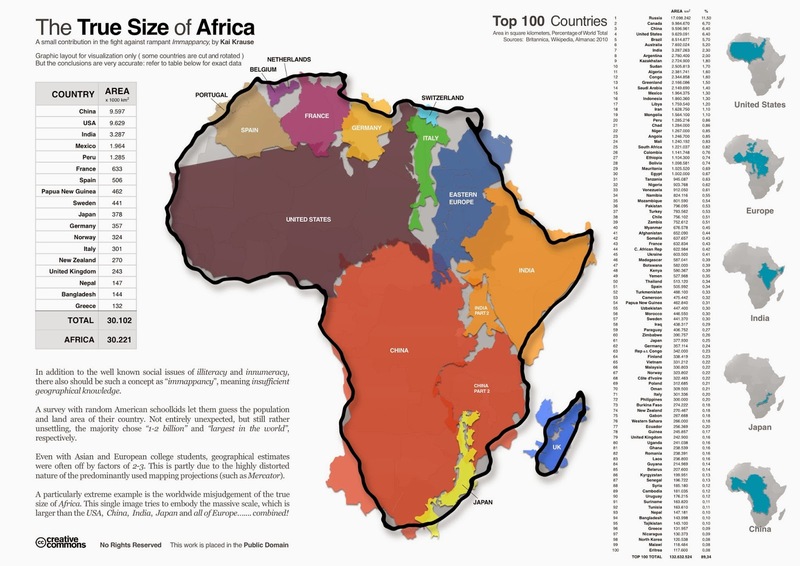 Most people have no idea just how large the continent of Africa is. As you can see from the above photo, you can fit the US, India, China, Eastern Europe and much of Western Europe inside of Africa. There are between 1,250 to 2,100 languages (some estimates put it about 3,000) spoken throughout the continent of Africa. For example, there are about 500 languages spoken in the country of Nigeria alone! Africa is not only the second largest continent by area, but the second most populated as well. There is over 1.1 billion people that live in the continent of Africa. From 1982 through 2009 its population doubled. There are 54 recognized countries in Africa. This is a great online quiz from the Washington Post to test your knowledge of African countries. The current outbreak (which is not the first for Ebola in Africa) is in Western Africa. To give you a perspective of where that is, take a look at the picture below. Now, compare that with the above picture of Africa to give you a sense of distance. We live well over 2,000 miles away from the current outbreak. Lake Victoria, which we live just a few miles away, is the 2nd largest fresh-water lake in the world, at 26,600 square miles. That is larger than whole countries. Only Lake Superior, in North America, is larger. The Nile–Kagera river system is the longest in the world at 4,132 miles long. Compare that to the Amazon–Ucayali–Apurímac river system at 3,976 or the Mississippi–Missouri–Jefferson river system at 3,902 miles long. Mt. Kilimanjaro is 19,341 feet tall, and the highest free-standing mountain in the world. The pyramid of Khufu at Giza, Egypt, is the world's tallest. Also known as the Great Pyramid, it is 451 ft high. Nigeria is the 7th largest country by population in the world at 174.5 million people. Algeria is the 10th largest country by area. We hope this gives you a frame of reference and insight regarding Africa. It is a very diverse continent in many different ways. And, we live in Uganda. Just Uganda.